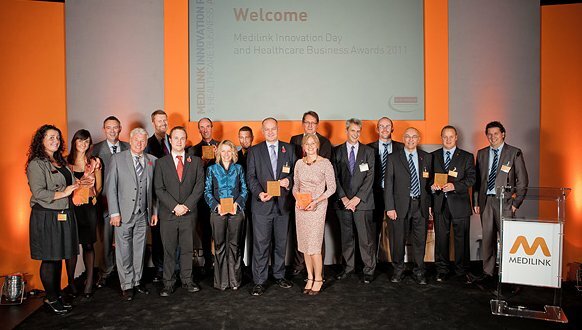 Professor Wendy Tindale has been announced as the winner of the 2011 Beacon Award for Outstanding Contribution to Healthcare, at the Medilink Healthcare Business Awards 2011, which celebrate healthcare excellence in the region. The awards took place at the Medilink Innovation Reception and Healthcare Business Awards, on the 9th of November at the York Railway Museum. In addition to 5 other awards for regional organisations covering areas such as Innovation and Partnership with the NHS, Professor Tindale was honoured with this years coveted ‘Beacon Award’ – acknowledging her lifetime dedication to healthcare and career of impressive accomplishments. Consultant Clinical Scientist and Scientific Director at Sheffield Teaching Hospitals NHS Foundation Trust (STH), Professor Tindale is also Clinical Director of Devices for Dignity – the organisation set up to drive forward innovative new products, processes and services to help people with debilitating conditions to deal with their daily challenges. Based at the Royal Hallamshire Hospital, Professor Tindale has worked within the health service in Sheffield for over 25 years, in that time contributing extensively to converting medical and technological innovations into front line patient care.